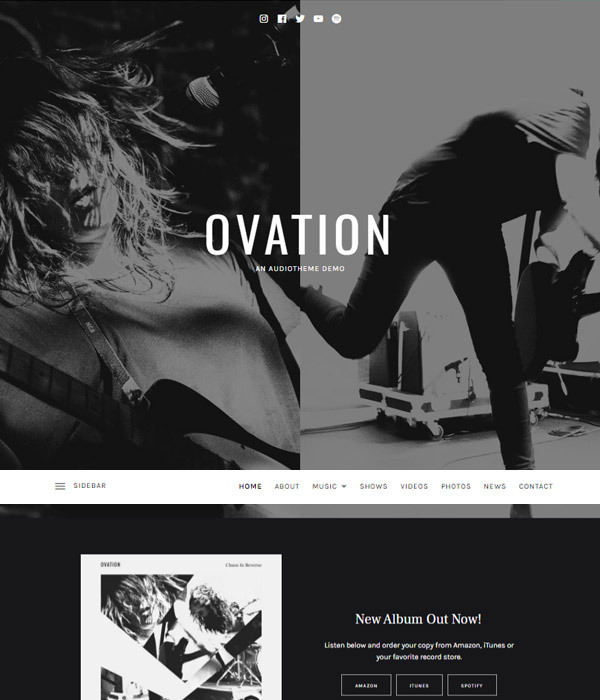 Ovation is a music theme by the team at Audio Theme. It is well designed and perfectly built making it a great choice for any kind of band or musician. I love the dark color scheme used in the Ovation demo. You can see right away that the demo would work particularly well for rock bands but the colors can be customized to work well with any kind of artist. The layout is perfect for bands and artists. Albums and individual tracks can be promoted with ease and the layout is broken up with engaging full width parallax images. You can also display your latest news to your fans and followers and keep them updated with events and gig information. 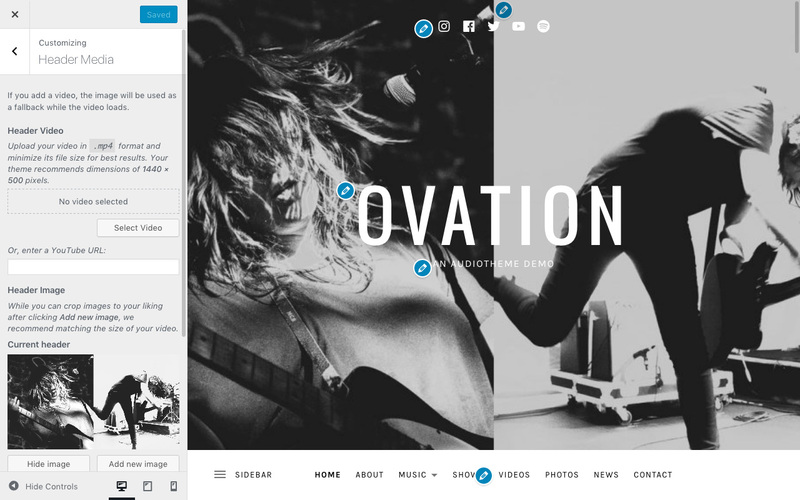 Ovation also includes integration with Instagram and the ability to show your video content – ideal features to help with promotion and show visitors what you are all about. Overall, the design is very effective because it includes everything you would want in an audio theme and it is very simple, clean and easy to use. As good as the design of Ovation is, my favourite part of the theme is the admin area. The customizer is utilised very well and allows you to customize everything you could want including colors and fonts. You can also make the header area stand out by adding your photos or by adding a background video in mp4 format. The most powerful feature of Ovation is the ability to use any page as a section on the homepage. This is a feature I’ve not seen before and it’s awesome! It makes it incredibly easy to add any kind of content you like to the homepage and arrange everything via the customizer. 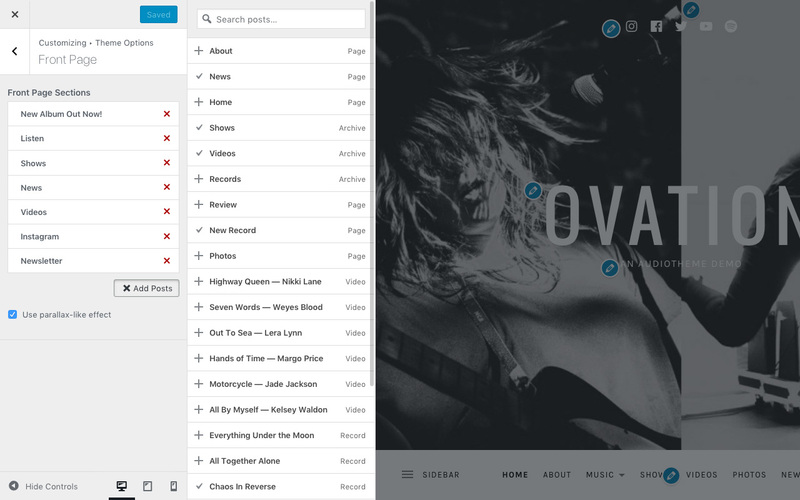 Ovation is one of the best audio / music themes for WordPress available right now. If you are looking for an easy to manage, great looking website that lets you do everything you need to promote yourself or your band then give it a try now.